I have improved the graphs after readers’ suggestions and assistance from Jo Nova. I have revised the GISS warming from 1.7 to “over 1.6” degrees /100 years. As a follow up to my analysis of temperature data for Mackay and Te Kowai, this study compares Goddard Institute of Space Studies (GISS) data with data from the Bureau of Meteorology for Gladstone and “nearby” sites in regional Queensland, and finds further inexplicable treatment of data leading to an exaggerated warming trend. Gladstone is an old port, meatworks, and fishing town, now an industrial city with a power station, bauxite refinery and aluminium smelter, plus a coal terminal. Interestingly, GISS makes NO homogenisation adjustment for Gladstone, and that aroused my curiosity. The Australian Bureau of Meteorology (BOM) has 3 records for Gladstone. The Post Office from 1909 to 1956 which is dead flat at about 22 degrees; Gladstone Radar from 1958 to 2009, which is immediately 1 degree warmer, and the Airport from 1994 to 2009, half to 1 degree cooler than Radar. Please note: all my analysis is from 1908-2009, 102 years. BOM data starts at 1909. GISS get their data directly from GHCN (Global Historical Climatology Network). Which do you think GISS/GHCN uses? The warm one of course. But how they use it is cynical- and informative. When developing station data, GISS state that Step 1 is “combining sources at the same location”. While GISS correctly claim they make no adjustment to their Gladstone data, GHCN/GISS have “accidentally” ignored 41 years of the earlier BOM data, which shows a flat trend at about 22 degrees. They have also completely ignored data from the Airport which is about 0.8 degree below Radar. But- and this is critical- they splice the last 6 years from the PO onto Gladstone Radar. Have a closer look at this. The Radar data is about 1 degree warmer than the PO. Making a trend from this spliced data is very questionable. As well, the data for Radar shows an upwards movement of about 0.5 degree in the last decade. Possibly GISS would say they’re only interested in 1951-1980 figures. However this has the effect of dropping the starting point. Now isn’t that a more elegant solution? That produces a trend of ~ 0.7 degrees per Century. So perhaps GHCN chose this 1.6 degrees per century slope to match that of nearby rural stations? Well actually, no, nothing matches. Then perhaps GISS homogenises Gladstone’s data to match the mean of neighbouring stations. No again- GISS have not made any adjustments for “inhomogeneities” such as station movement from PO to Radar. I have included the graphs and notes in an Appendix below for you to check- I find them interesting. For the sake of brevity, I will skip straight to the conclusion. Although GISS can truthfully say they have not adjusted the GHCN data, the splicing of the last 6 years of the Post Office dataset to the warmer Gladstone Radar leads to a trend of more than 1.6 degrees Celsius per Century. I have shown three possible options for more appropriate adjustments to combine all temperatures at the one site. Of these, the highest trend is about 1.5 degrees, which is close to the trend (1.4 degrees) of the nearest rural sites. Examination of these sites shows that their data is of questionable quality. The second option produces a trend of 0.9 degrees, and the third and (in my opinion) best option, 0.7 degrees. The average trend of the 5 nearest long-record rural sites (0.8 degrees) is between these last two options and so matches well. Nearby cities of Rockhampton and Bundaberg show adjusted trends of about 0.7 and 0.5 degrees respectively, and Maryborough, ignored by GHCN, shows a trend of 0.4 degrees. Thus the GISS record for Gladstone is derived from cynically cherry-picked data. The resulting trend of more than 1.6 degrees Celsius per Century cannot be justified. The record is false. At the GISS website, the responsible NASA official is listed as Dr James Hansen. I will leave it to others to decide what he is responsible for. Mt Morgan has a cooling trend but has many gaps. Biloela DPI, like many stations, has a gap of 8 years from 1956-1965. When the data resumes, it has jumped by 0.5 degree and continues rising at this 2 degrees/ 100 years rate. Why would a rural site, only 83 km from Mt Morgan, be warming at this rate? Interesting. Yeppoon’s data is too short and patchy to be much use. Monto has a patchy record with gaps, only from 1962. It also shows a trend of 2 degrees per 100 years. The airport’s very scanty data appears to be half to 1 degree below the township. What happened to the data before 1962? Monto was settled in the 1920s. GISS calls it “Monto Post Office was 03”. What was the “03” ? Without the missing data no conclusions can be reached. Lady Elliott Island shows a trend of about 1.6 degrees warming, but note the cooling, warming, cooling- very interesting. I will check coastal and island data in a later study. Baralaba’s record is far too short and patchy. Although the average of these 4 stations (excluding Yeppoon and Baralaba) of 1.4 degrees is still less than the warming at Gladstone shown by GISS/GHCN, the data quality may not be good enough to use any of these except Lady Elliott Island to “justify” Gladstone’s data. Let’s look at some longer records. Childers has a trend of about 0.9 degree per 100years (according to GISS), but only about 0.2 degree up to 1956 when there’s an 8 year gap. Gayndah, one of the oldest towns in Queensland, shows a linear trend of about 1.4 degrees /100 years. Note the 4th order polynomial clearly shows the flat trend to the 1950s, and the 1.1 degree rise since then. Incidentally, Gayndah’s record goes back to 1893, with the hottest year on record being 1897, but I will stick with my 102 year analysis as that matches the majority of long records and BOM is not confident about much data before 1910. Sandy Cape Lighthouse shows a linear trend of about 0.5 degree/ century, and a small cycle is very evident. Note the 1940s. Gympie is 291km south, and a large regional town, once a roaring gold rush town. 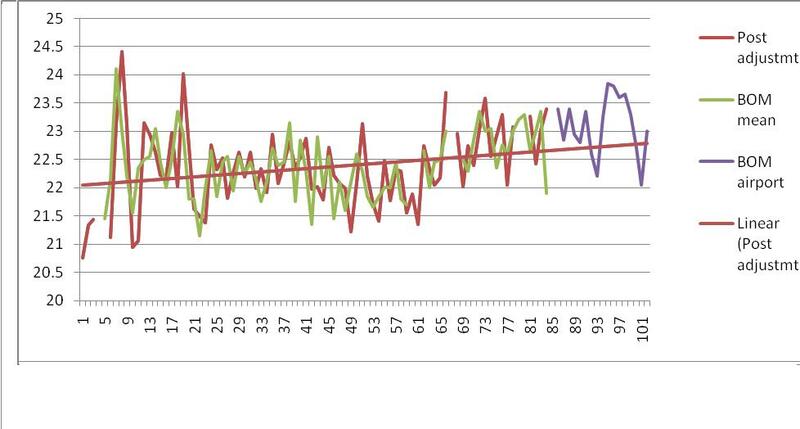 GISS shows a trend of about 0.5 degrees/Century, and BOM 0.3 degrees. 30 years cooling! Emerald, 316km inland, shows maybe 0.8 degrees over 100 years. Note the large step up (UHI effect? ), after a declining trend, from the 1970s onwards, when the town boomed with expansion of irrigation, then coal mining. Also note the warm period in the early 20th Century. Airport data seems flat or lower. Handle cautiously. The average of these long term stations’ trends is 0.8 degrees- midway between my adjustment Options 2 and 3. 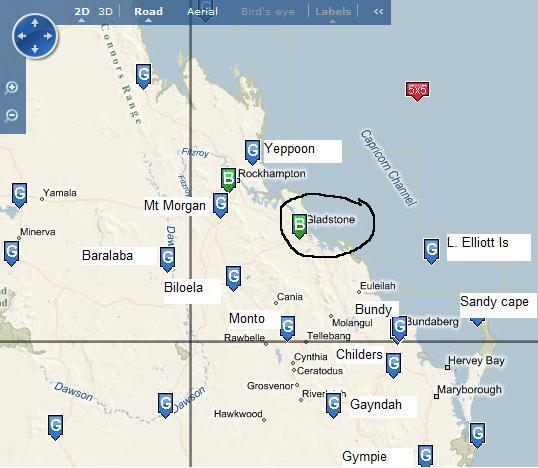 Next, let’s compare Gladstone with its next door cities, Rockhampton, 95 km north, and Bundaberg, 159 km south, both adjusted appropriately. I will be studying their adjustments in detail in the near future. Rocky– adjusted trend about 0.7 degree. Bundy– adjusted trend about 0.5 degrees. Even more interesting is a station that GHCN and GISS totally ignore- Maryborough, a small city with a long record, about 240 km south. The trend? Maybe 0.4 degrees. This entry was posted on February 23, 2010 at 8:06 am and is filed under Uncategorized. You can follow any responses to this entry through the RSS 2.0 feed. You can leave a response, or trackback from your own site. I get a stepwise downward adjustment to the Brisbane data in the early years (this will be shown in a post shortly) in the early years and none in the latter years turning a cooling trend into a warming trend. BOM’s adjustments yield an even greater (much greater) warming trend for Brisbane. I must get my act together and whip my stuff into shape as I haven’t touched it for some weeks. Your stuff has inspired me to complete it. Your work is excellent and very inciteful! I really appreciate the effort you put into this and watch your blog every day for your updates. I know how long this takes to put together a logical and well presented post. Your updates are worth the wait. Well done, Ken. Keep up the good work. Might be interesting to photograph the actual data collection site with a thermal imaging camera. Any localized hot spots would stand out. I hope you realize that the GISTEMP algorithm is automatic and not a manual process. It is possible that the algorithm will fail on certain stations. The hope is that any failures do not bias the final result. Evidentially they don’t because other groups with different algorithms have come to similar results as GISTEMP. 2) any failures have not biased the final result, and other groups have same results, so they haven’t. 1)- Then why the obvious range of adjustments? And why would the final trend for Gladstone be double that of surrounding rural stations? And why would adjustments at many sites INCREASE the UHI instead of decrease it? 2) The algorithm has failed in 5 out of the 8 sites in Queensland that I have studied. There are large numbers of examples of this in other countries. The other groups- presumably you include HadCruT- share (both ways) a large proportion of their data with GISS. And we can’t check HadCruT- remember? So sorry- I don’t agree. GISS hasn’t ignored 41 years of the earlier BOM data. Neither have they spliced the last 6 years of PO onto radar. The GHCN raw data does not contain data prior to 1951 for this station and it is GHCN raw duplicate 0 that contains the 6 years of PO spliced onto radar – this is the error. GISS can only choose to use or ignore something that is in GHCN. If it’s not in GHCN they don’t have that choice. Equally GHCN will have taken what has been provided by BOM. GHCN contains 6 raw duplicates for Gladstone. That means six sources of temperature data for Gladstone was found when GHCN was compiled. It looks like the first source of temperature data contains the splice of 6 years of PO followed by radar up to 1992. This probably means that around 1992/1993 that format of temperature data for Gladstone was published somewhere. GHCN has taken that and assigned it “duplicate 0” for Gladstone. GHCN found 5 other sources of temperature data for Gladstone and assigned them as other duplicates. At least one of these sources is updating automatically, because I notice duplicate 2 extends to present day – either that’s the airport or radar I guess. Ideally GISTEMP could have identified the error in GHCN duplicate 0 and discarded the 6 years. But it’s not trivial to automatically detect such errors and as I said some will slip through any automated process. OK, GISS takes GHCN data which gets it from BOM. That doesn’t alter the fact that there are 41 years missing. Nor that the resulting trend is twice that of surrounding rural stations and nearby cities. Shouldn’t that ring alarm bells? Shouldn’t that be homogenised? Nope, it’s warming nicely, let her rip. I’m flattered by attention from across the world, including Amsterdam. In my short work, stations close to the sea often show nearly flat responses, while those inland by a few hundred km or more often show a sharp increase. I’d be delighted if you looked at the site above and its supplementary information to see if you are getting the same impression from your work. BTW, some of my ancestors were born at Monto and my father’s family had 400 acres at Childers/Booyal in the 1920s. I was born at Oakey. My wife Colleen & 2 children lived at Mt Morgan for a year about 1975. So it’s familiar ground. I’ve just had a(belated) look at your work. I agree, why is the apparent trend higher inland? You mention no evidence of UHI, which I think IS evident in a number of the records (Emerald, Ayr, Bowen, Charters Towers amongst others). I look forward to discussing this with you at a later time. I’ve bookmarked your site. PS Do you get trolls too? PPS I’m from Biggenden originally. It seems that what GISSTemp says is not necessarily what GISSTemp does.